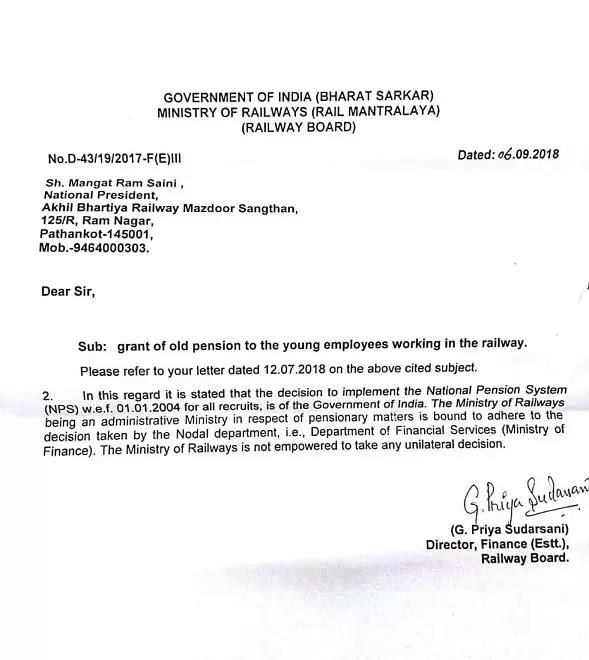 Sub: grant of old pension to the young employees working in the railway. Please refer to your letter dated 12.07.2018 on the above cited subject. 2. In this regard it is stated that the decision to implement the National Pension System(NPS) w.e.f. 01.01.2004 for all recruits, is of the Government of India. The Ministry of Railways being an administrative Ministry in respect of pensionary matters is bound to adhere to the decision taken by the Nodal department, i.e., Department of Financial Services (Ministry of Finance). The Ministry of Railways is not empowered to take any unilateral decision. I don’t understand the concept of the above ,All are given to understand that pensioners status comes only after 60 years of age !! !